My father is a good man—kind, generous, caring. A man of honor, a man of his word. For a young girl, a caring, supportive father is one of the greatest gifts she can receive. My parents taught me right from wrong, instilled values and morals. My father gave me direction, taught me to believe in myself, gave me a voice. I could do anything I set my mind to, he taught me. I could be president. Or I could write. Anything—if I wanted it badly enough, if I believed. My father, Jerry, and his sister, Jo. 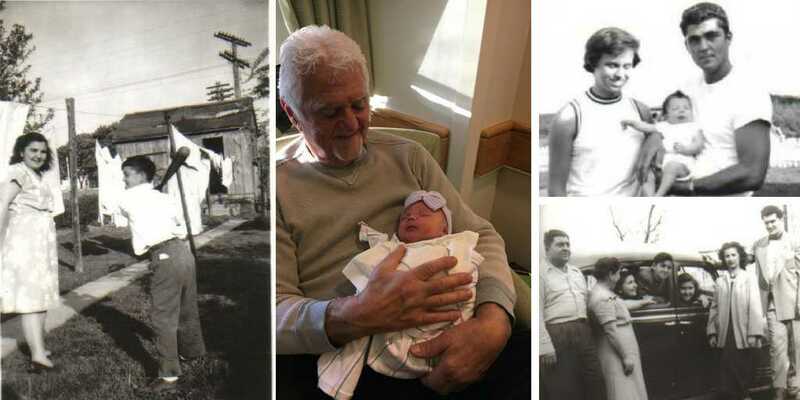 The youngest of five children, my father grew up in a tight-knit Italian family. 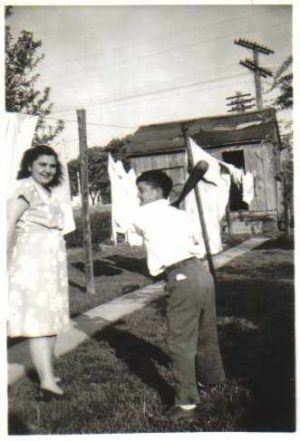 His parents had immigrated to America before he was born, settled in a neighborhood of Italian immigrants. With only a grammar school education, his parents worked long hours at menial jobs. Their children wore Catholic Charities clothes, with tags identifying them as donations, built bikes form scavenged parts they found in the junkyard. Wealth, I learned from my dad, is about more than money. In his neighborhood, families looked out for one another; omnipresent Zias and Zios watched out for the kids, a warm bowl of spaghetti always at hand to feed a hungry child. The injustice infuriated my father. And he drew strength, I believe, from his anger. 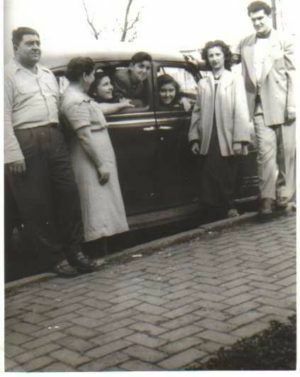 My father in the center, flanked by his two sisters, my grandparents to their left, my dad’s brother Nick and his wife to the right. My father was only twenty years-old when I was born. After high school he’d enlisted in the Air Force and my parents and I lived in a trailer on base, the quarters so small that, stretching his arms, my dad could touch the side walls. From 7 to 7 he worked as a mechanic, and six nights a week waited tables until 2 a.m. at the Officer’s Club. Exhausted, he did what he needed to do. After his discharge, my parents returned to their hometown and my father found work in a factory. My parents had two children by then, our family growing. Money tight, he requested a move into sales—request denied because, as is often the case with first-generation children, his speech was not up to snuff. Smart, motivated, eager to learn, he enrolled in night classes at a community college. Soon, he’d not only been promoted to sales—he was writing the company newsletter. I read voraciously, but this was my first exposure to writing, and I was enthralled. 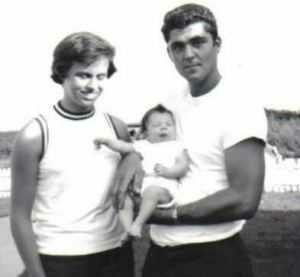 Here I am with my parents, in my dad’s arms. My father insisted we stand tall, and use proper English, because words like ain’t do not sound cool: educated people simply assume you don’t know any better, or just think you’re stupid. Unsurprisingly, with his intense work ethic and fierce determination, my father excelled in sales. His work required spending time on the road, and he was often gone a week or two at a time. This was the sixties, and he brought home appalling stories of segregated fountains and toilets, arguments with clerks when his black partner was denied a room in a hotel; and around the kitchen table we talked about the immorality of judging a man by the color of his skin. My father taught me to be firm in my beliefs, and to fight, if and when fighting was called for. Like Superman, he leapt tall buildings in a single bound, in part because he believed he could, but more, I think, because he refused to let any building, any obstacle, however threatening or tall, stand in his way. Watching my father, I learned strength, determination, resilience. I learned to persist. I learned to dream and to pursue my dreams as if my life depended on it, because the life I want to live does. By listening, he taught me to listen, and gave me a voice. Today we’re in the midst of a #MeToo revolution, with strong, courageous women fighting back against men who’ve used their power to abuse and control women they perceived as voiceless or weak. As in any battle, we employ the weapons at hand—social media to call out abuse, to banish offenders from their thrones; media to force institutions to take tangible action, and, by keeping the news in the forefront, press for wider cultural change. As we should, as we must. Real change, lasting change, however, begins in the home. 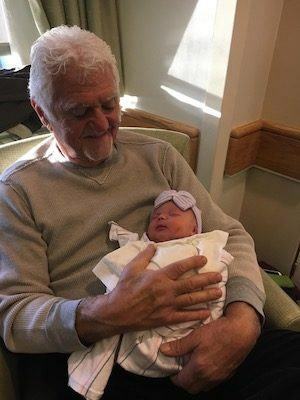 My father, Jerry Giuliano, with great-granddaughter Finola. Today, every day, we need good men. Girls and women need fathers to be superheroes—not only—or necessarily—to protect, but to appreciate and support them. Good men teach their daughters to dream, to believe in their dreams. And more important, to believe in themselves. Good men stand with their daughters, teach their little girls that they have every right to say no to powerful men, instill the strength to fight those who won’t take no for an answer, resilience to stand when they’re down, the courage to speak truth to power, demand an end to injustice. Good men demand integrity of their sons. Abuse is not a case of boys being boys. Good fathers teach their sons to be agents of change, that women, inherently equal, deserve their respect. Fathers—mothers—real life superheroes, can create seismic change, one girl and boy at a time. At eighty, my dad may not be as tall as he was, his hair may be gray, but on his broad shoulders he carries more weight than most men half his age. And he will always be a superhero to me. Dear Terri, as long as I have known your Dad he has always asked the question, “Why not?” Never taking no as the final answer. A man of great integrity and strength that he passed on to his children and grandchildren. Thank you so much, Ivy! This comment means such a lot! How lucky you are to have such a wonderful father, and how lovely that you honour him like this. I too had a very decent, moral, loving, quietly good dad – we lost him nearly a year ago, aged 88, and whenever I get too sad, I remind myself that not everyone’s as lucky as me, to have had such a gentleman as their dad up until they are 60 years old. Hi Julia, I am so sorry for your loss and so touched by your comments. I am truly blessed to have such a wonderful father. Thank you so much for taking the time to stop by and read the piece.